As a bride, you have a million things on your to do list before walking down the aisle. One of the things that should be fun is creating gift bags for your bridesmaids. Obviously you couldn’t imagine your wedding day without them, so you’ll want to find perfect items to show your appreciation. Well there’s always booze (champagne, yay! ), jewelry, and gift cards. 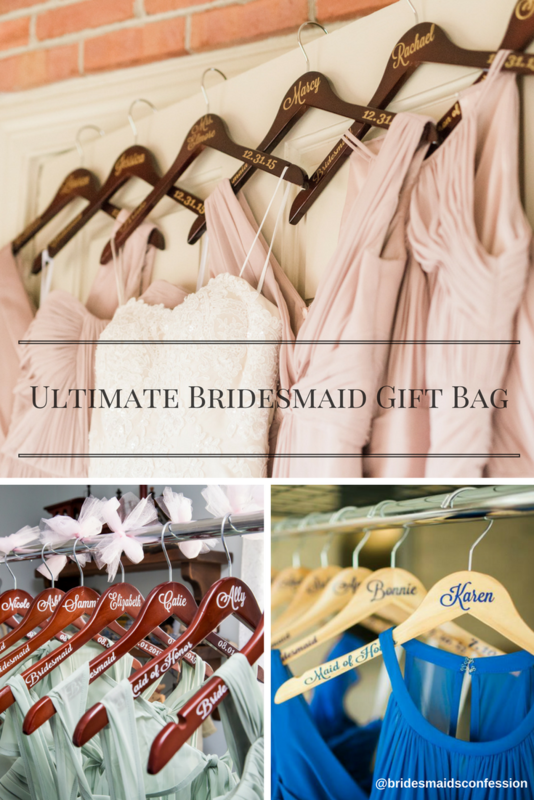 However, we’re here to help you create the Ultimate Bridesmaid Gift Bag, and it takes some really special gifts to make our list. 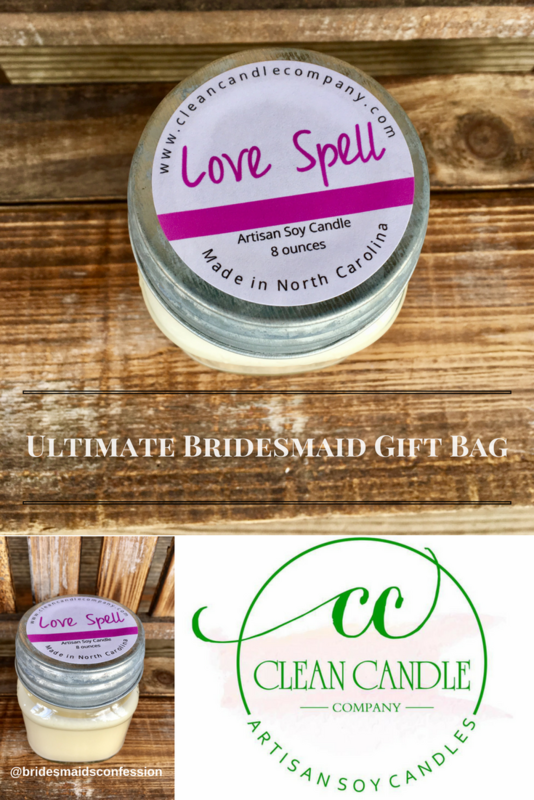 The most important part of creating the perfect gift bag is to make sure it’s something your bridesmaids will want to use again and again. Gifts that will remind them of the joy of your wedding, long after the day is gone. Why these make a great gift: These hangers from Everything Done To a T have a variety of uses. They’re not only a great keepsake for your bridal party, they create a beautiful photo-op while everyone is getting ready. Rather than confusion and ugly plastic bags everywhere, all the dresses can be hung with style! And it’s nice to have a touch of individuality in a sea of same dress, same shoes, same hair, etc. More about this vendor: I’m Tara, a born and raised Jersey Girl, married to my college sweetheart and mom to 2 boys (ages 5 & 3). When I got married in 2009 I did a LOT of DIY projects for my wedding. That snowballed into helping friends and family, to forming a business, and then opening my Etsy shop. My products are all handmade (by me!) to add a little something extra to your event. Whether it’s personalized bridal party hangers, save the date wedding signs, or monogram wine glasses; my items sprinkle a little magic on top of an already special day. Why these make a great gift: The fabrics used by Oh Sugar Bride are so SOFT, washable and fuss free. No worrying about wrinkles, no asking ‘can I dry this?’ and now finally having a robe that you look forward to wearing. We are all Queens in our home, these robes will definitely make you feel like one. How would anyone not love a special, thoughtful gift like this?! 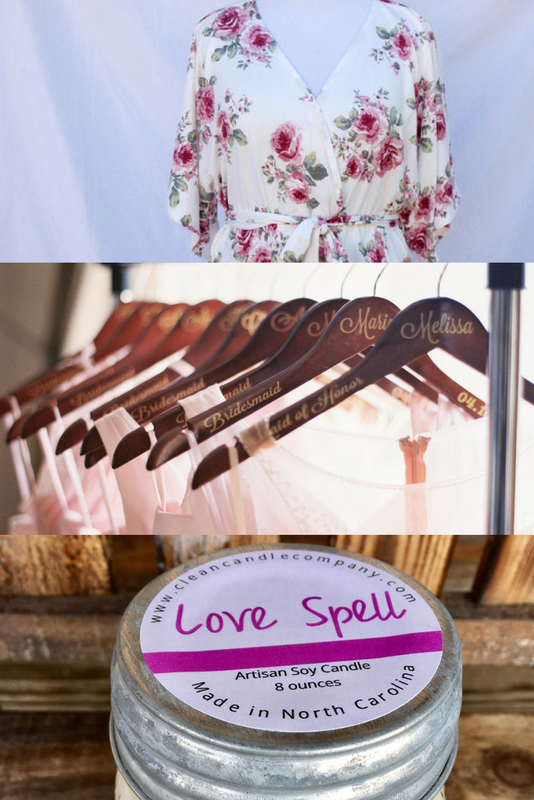 More about this vendor: I’m Steph, a wife, mom to 2 boys, and small business owner. I love reading fiction, staying caught up on Hulu, and obviously ALL things floral! My business started when I fell in love with sewing children’s clothing. Little floral dresses and rompers were my favorite. One day I posted a picture on IG of a robe I made for my BFF as a postpartum gift. My followers LOVED it and wanted more. 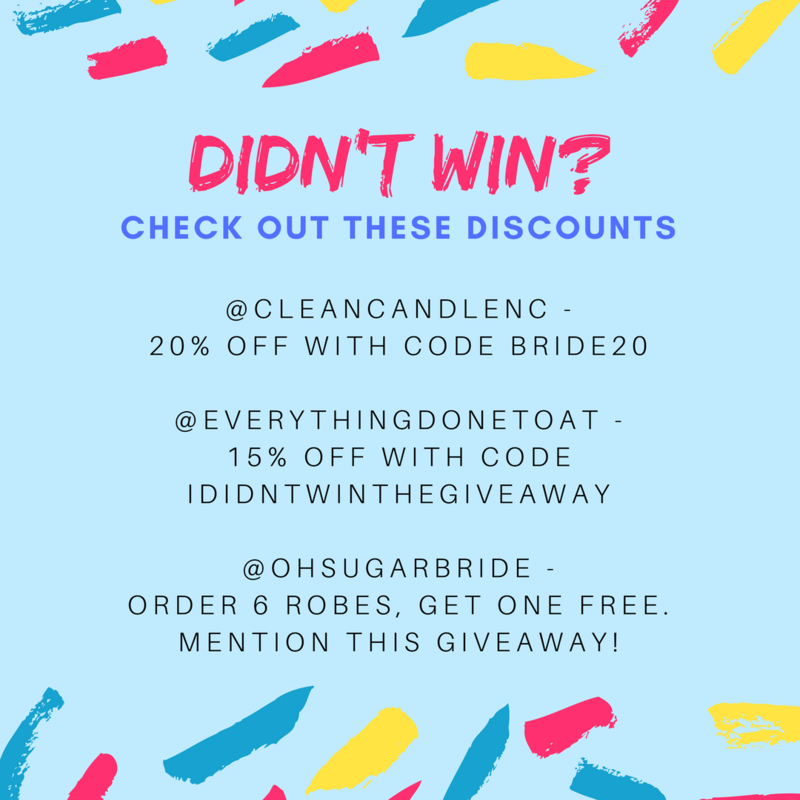 Over the last 10 months I’ve been curating the best fabrics and floral prints, so I can offer the BEST custom (not to mention handcrafted) robes, and women’s clothing to everyone! Why these make a great gift: These candles from Clean Candle Company are made with American grown soy beans, using only phthalate-free fragrance that has been safety-approved. They are 100% vegan and cruelty-free. There are dozens of different scents to choose from, and several different containers, including mason jars or vintage cups. In addition, you can choose standard labels or customized ones with names, monogram, or special messages. Candles are always an easy go-to gift that everyone is guaranteed to love, especially in the customer favorite love spell scent. More about this vendor: I’m Erin, a resident of North Carolina, and mother to my 7 month old son, Grayson. My mother started making candles in 2010 and I learned from her. Last year, while I was pregnant, I completely rebranded the business to allow me to work flexible hours and bring in an income while taking care of Grayson. My current line of candles works well with farmhouse style decor. Later this year I am coming out with a yoga candle line, as well as candles featuring Bible scripture. I also do wedding favors, bridal shower favors, “will you be my bridesmaid” gifts, and have a men’s line for groomsmen gifts. Disclaimer: Winner must be 18+ and live in the United States. Contest ends Friday March 17, 2017 at 11:59pm EST. Winner will be contacted via Instagram to provide an address where items can be shipped. It can take up to 4 weeks for items to ship. Cost of shipping is included in the overall value of the prize (est. $20 shipping). The total value of this package is $120. Note, you will receive a voucher for the hangers so a custom order can be placed. Reach out to the shop owner right away to make sure they will ship in time for your wedding. Which gift above is your favorite? What else would you include in a gift bag to your bridesmaids? Share with us in the comments. What a lovely gift for someone! Absolutely love the robes, though everything is gorgeous! There will be a very happy winner! Thank you. We always try to find amazing shops to share. 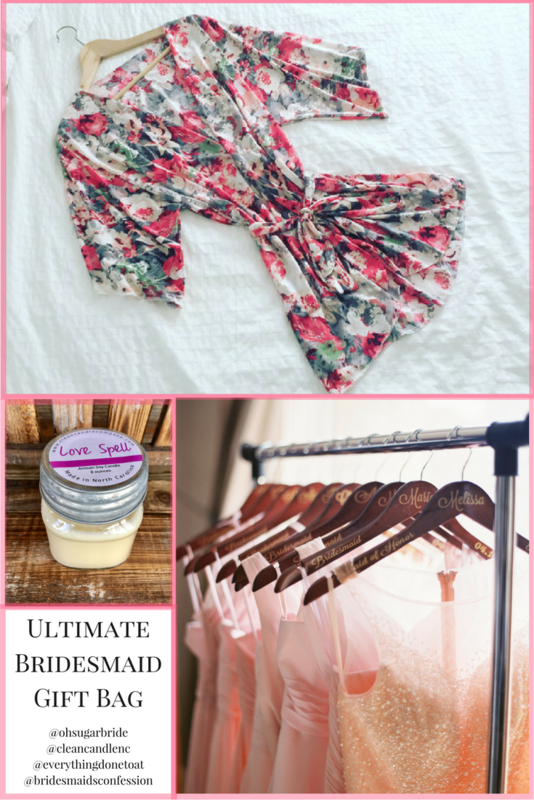 The hangers are a really cute gift to keep the dresses organized and use later. Love the hangers! Adorable and practical, the best combo. Thank you! Glad you agree that they are fun practical gifts. Love spell is such an amazing scent. I like the robe! I would include a picture of the two of us or photo book! Awww that is a really sweet idea to add a picture of photo book! These are definitely fun gifts to receive. I think my favorite is the robe. 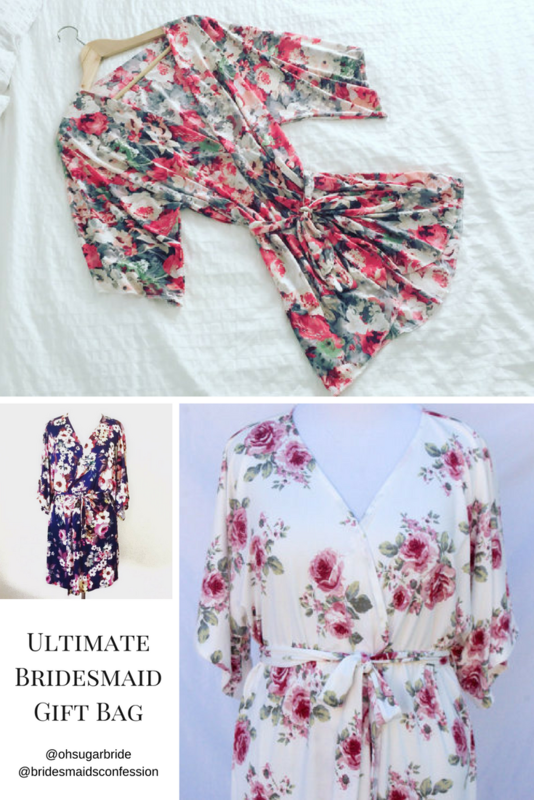 These floral patterns are so unique! Each robe is hand sewn. I love the robes! You can get some awesome getting ready pictures in this those! Yes. They are perfect for getting ready so you don’t mess up your hair and makeup. Love this post! I am getting married in July and need to figure out what I am going to gift my ladies. I have 10 bridesmaids so the bill is going to add up quickly. Crossing my fingers on winning this giveaway!! I think the hangers are really awesome and unique! I’d add a bottle of wine or champagne to my gift basket! Now THAT would truly by the ultimate bridesmaids gift bag. Ha! I wish our state liquor laws allowed us to gift wine or champagne. Amazing Gold Foil Prints for a DIY BarDIY, Professionals Confess!